Are your HR policies up to date, and are they effective in reducing potential liability for common problems? Does your company have clear and specific policies regarding the handling and documentation of common problems – and do your employees know about them? Constangy attorneys take the time to understand your business objectives and your organizational culture. We want to know what it is that sets you apart from your competitors—what makes your company unique, and what values and attributes you seek to foster within your workplace. 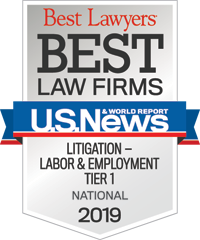 From there, we partner with you to develop policies, procedures and strategies for preventing employment claims and litigation, while capturing the mission and culture of your business and preserving that which sets your company apart from the rest. We have found most of the companies we counsel benefit from an annual HR audit to reduce exposure to employment litigation liability and help your HR department operate smoothly. This in turn can increase productivity, reduce turnover and help maintain workplace morale. Our attorneys can guide you through a comprehensive audit and review of your policies and procedures across the full range of employment issues to help you identify and correct weaknesses and ensure compliance with relevant national, state, and local laws and regulations. We can also help you conduct audits in anticipation of, or in connection with, due diligence reviews associated with contemplated sales and/or M&A transactions. We regularly draft employee handbooks, manuals, and employment-related policies, and offer counsel on the implementation and enforcement of such policies. Policy subjects are wide-ranging, and include background checks, drug testing, pre-employment testing, anti-harassment, paid time off, employee leave administration, and the protection of trade secrets. Whether you have an existing handbook in need of review and/or update to ensure compliance with the latest legal developments and best practices, or whether you need a new handbook developed from scratch, we will address your specific requirements and individually tailor each policy to best suit your company’s needs and objectives. Whether your company operates out of a single state or up to all 50, we can draft policies to ensure compliance with all workplace laws applicable to your organization, as well as line of business, subsidiary or enterprise-specific, or region-specific policies—depending on your preferences and operational needs. Whether you need advice on day-to-day matters or assistance through seminal events, Constangy attorneys have the experience to provide prompt, practical assistance. We routinely advise employers with regard to rights and obligations under the many statutes and regulations that govern the employer/employee relationship. We consult with clients regarding terminations, discipline, and general performance issues; we conduct investigations of employee misconduct, including allegations of harassment and discrimination; we advise on compliance with leave of absence and disability laws, including federal and state family and medical leave acts and other anti-discrimination laws, including the FMLA, ADA and COBRA; and we provide advice on employment issues affecting corporate transactions such as mergers and acquisitions and counsel clients through terminations, reductions in force, workforce restructurings, and plant closings, including WARN Act compliance. For more information, contact Jena Cottreau at 571.522.6100, or any Constangy attorney.